Only a fin stabilizer system can handle both cruising and at-anchor well. 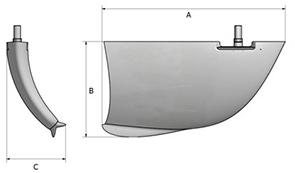 On a typical fin stabilizer system optimized for at-anchor stabilization, the fin size is larger than the fin used for underway only. Larger fins provide more stabilization force, but also create more drag which equals higher fuel consumption, especially at higher speeds, an important point for most boat owners. Larger fins also means that the internal components grow in size, making it difficult to install them in an optimal position. Some stabilizers end up with negative side-effects like causing yaw (steering effects) and sway (side-ways movements). These side effects force owners and designers to compromise stabilization for efficiency. With the introduction of the Vector Fin™ and Side-Power's range of compact actuators, there is no need to compromise. Now you can have it all; speed, efficiency and a stable boat. 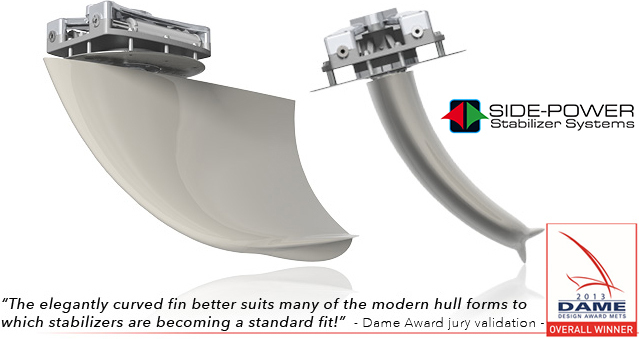 The Side-Power Vector Fin™ stabilizers improve the roll reduction efficiency by some 50% in at-anchor mode, and 30% while underway, while at the same time reducing undesired yaw and sway motions caused by active fins.The huge benefits both in efficiency and reduced side-effects makes them particularly ideal for any type of vessel from today’s modern, fast cruisers to trawler style vessels with lower speed ranges. Each have their own challenges: Lighter, fast boats are more prone to sway while at anchor. (This is where the fins physically push the boat side to side rather than reducing the roll.) Trawler style boats require bigger fins and become prone to yaw. (The fins steer the boat as they actuate causing wear and tear on the steering and stabilizer systems and reducing the efficiency of the hull.) In each case, vector fins redirect this wasted energy to better stabilize the boat and minimize these ill effects. How can Vector Fins™ be so much better? Vector Fins™ simply re-direct the force direction. This means that they could send vectors towards a direction where more of the force will benefit roll reduction, and less will be spent on the negative side-effects of yaw and sway. The vertical concave shape of the fin makes the net force directions, both in cruising and in at-anchor situations to be re-directed so that they work more “up/down” instead of parallel to the hull angle. There is more by changing the net force angle, this also increases the leverage arm around the boat’s rolling point, further enhancing the roll reduction. This provides a lot more roll stabilization per fin size, which means that drag, power consumption, and internal space occupation as well as load on the mechanical parts is significantly less. It truly is a simple solution to a complex problem. Simple theory is not enough to prove the effectiveness of these boat stabilizer fins. The data below was taken from a Princess 56 comparing straight fins to the Vector Fins™ with the same actuators and the same control system. *20-30% in cruising/40-50% at anchor with same size, same inside space requirements and same power consumption. **30-35% in cruising/45-55% at anchor with the same stabilization force and same power consumption.